Cornet Euan Reilly is riding high as this year’s callant, and not even a fall on the way home from Cogsmill on Tuesday could bring him back down to earth. 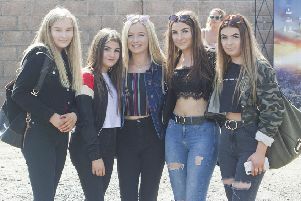 Acting Father Stuart Sharkey said: “Cogsmill was first class, with some lovely weather, and it was great to see the kids at Drumlanrig school and townsfolk out in numbers to cheer us all on. Looking ahead to this weekend, Stuart said Roberton was one of his favourite ride-outs, and added: “Caja’s family lived there for 15 years, so she is very well known in the local community, and she loves catching up with old neighbours. “I just love the countryside and the views from horseback are amazing. Tomorrow’s ride-out to Roberton leaves Backdamgate at 1.30pm and follows the route along the High Street, Dovemount, Princes Street, Dickson Street, Stirches, Stouslie, Whitehaugh Moor, Blawearie and Borthwickshiels, arriving in Roberton at 3.45pm. Horses leave Roberton at 5.45pm via Parkhill, Chapelhill, the Vales, ford the Teviot and Allan Water at Newmill, Southfield, Pilmuir Rig and Pilmuir Field, arriving at Hawick Moor at 7.50pm, down the Nipknowes and the Loan to Tower Knowe at 8.30pm. Tuesday’s ride to Northhouse Farm leaves Backdamgate at 1.30pm and follows the route up the Howegate, Loan, Crumhaughhill Road, Longbaulk Road, Martinshouse, Goldielands, Fenwick, Whitchesters, Newmill, Branxholme, Harwood, Commonside and Northhouse, arriving at Northhouse Farm at 4pm. The cavalcade leave at 6pm and ride to Northhouse, Skelfhill, Acreknowe, Wulliestruther, Nipknowes and the Loan, before arriving at Tower Knowe at 8pm. Supporters are in for a mouth-watering treat at Northhouse Farm on Tuesday when a hog roast will be fired up in aid of two local good causes – Hawick Ambulance Station and the Saxhorn Band. The meat will be served from around 4pm.